The first time you meet Junichiro Inamoto, he is working in the back office of his shop Tokyo Hotaru-do, or Firefly Hall. It’s up a narrow lane between two buildings in Asakusa’s Rokku, signposted by a headless, kimono-clad mannequin with an ace-of-hearts playing card in her lapel. The lighting is warm and incandescent. A transistor radio burbles tinnily from a hook. 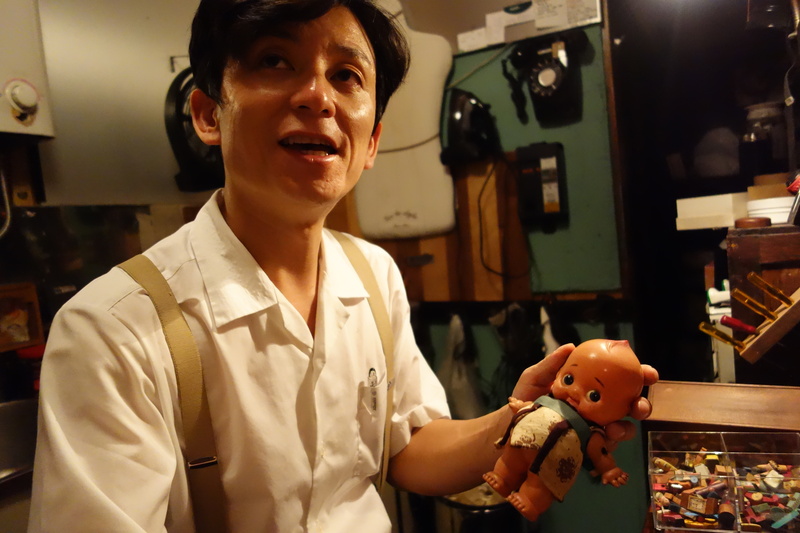 Inamoto is polishing a Kewpie doll. He says, It’s 1950s American. Also on his workbench: 1950s Japan. These are tiny cars, a mock radio, a miniature omelette pan, and other trinkets – the famous o-make giveaway toys that came with Glico caramels since the 1920s. Many were later reportedly made from wartime debris. He picks up a futuristic police car and says, They are made with great precision. Inamoto’s baggy trousers are also from the ’50s, though he would prefer a pair from the ’20s. That was more the golden age of Japan’s 20th century. That’s the age he would go back to. Asakusa then had the 12-storeys Tower, with Japan’s first elevator. Tokyo had modernism, and so many possibilities. It had mo-bo and mo-ga – modern boys, modern girls – the stylish, eclectic young things who fluttered about the Ginza. There’s more to Hotaru-do than antiques. Inamoto has a mission. He wants to look at old things afresh. Stuff that is being lost, in clothing, design and ideas. He says, Some of these things, like the toy cars, come out of the back of wardrobes. I go around the countryside to find stock, and I learn about them, and maybe I eat something interesting locally, talk to people, and I come back and pass all that on to customers here. And with that money I can go and buy more and learn more, and pass that on. He isn’t reserved about saying what he thinks. He says, People are stupid. Always desperate for new things, wrecking old things and throwing them away. He says, Fireflies can only live in areas with pure water. Although Tokyo is dirty, I want Hotaru-do to be the water, and to attract the fireflies. He says, One of the meanings of the word “-do” is a study hall within a temple. I want people who come here to learn about and appreciate things worth keeping. He gave up death metal and moved to Asakusa, to a flat above the three-level building that would become his store. He sees humour in such cultural dilemmas. He surprises you one day when he says, You know, I used to play death metal, and punk. I sang and played guitar and bass. Sepultura, Sore Throat, I listened to them all. Heavier than Metallica. And then I started to wonder…if I couldn’t do something a bit more Japanese. He gave up death metal and moved to Asakusa, to a flat at the top of the three-level building that would become his store. 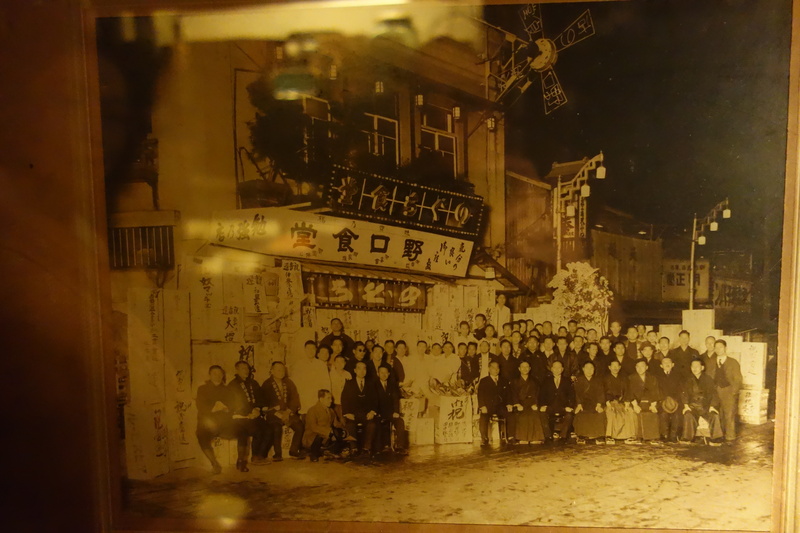 It used to be a restaurant, Noguchi Shokudo, and an old photo of it with a big gathering outside like watchful ancestors adorns a wall. He opened the shop six years ago, then married his wife Yoko. She was my first customer, he says. Yoko is friendly, efficient – and tolerant. 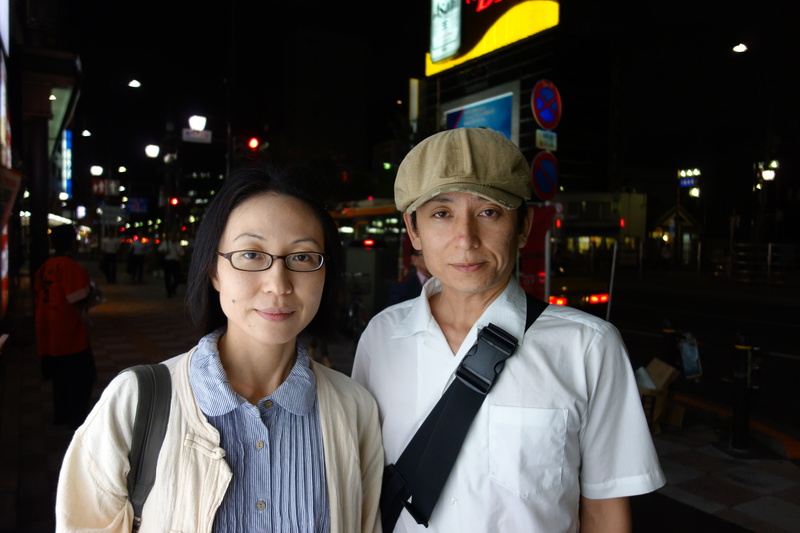 She says, like a Beatles fan, They call us Jun and Yoko. They fight a lot, but are fellow travelers. She is Asakusa-bred and has a fine style. She buys many of the vintage clothes, and is launching Hotaru-do’s own-label clothing, starting with a line of hats, and now working on long, old-style aprons. Inamoto says, We want to do our own thing with nothing fancy, just an old-standard base. To promote his cultural program, Inamoto launched a get-together, Social Club Modern Tokyo, on the second Sunday of each month upstairs in a coffee shop across Rokku. He and a group of musicians cleaned the space, previously a grimy mahjong parlour, and now use it for events and performance. 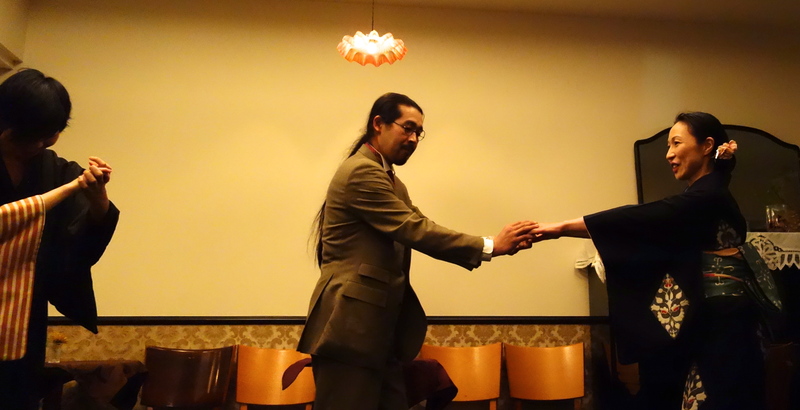 People come to enjoy dressing up – girls in kimono, boys in suits, or kimono – and for a sort of ballroom dance. Blues dance, rock step, and others. 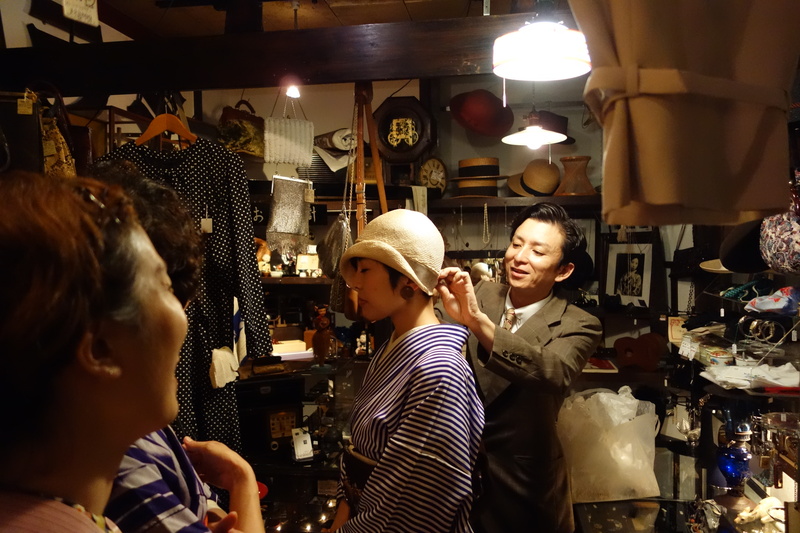 Afterward, some of the fireflies flit across to Hotaru-do, to change or try on clothes, like new hats. You would have felt silly being the only one not trying to dance. When you went to the November event, you were not planning to dance, as you have two left feet. There were two bands: double basses, banjo, accordion, singing and ukulele. There was also a punning sort of senryu poetry-reading with a blackboard. If that makes it sound a bit like a deportment session, the two hours went fast. The people are warm, and there is a joint air of encounter. In the end you would have felt silly being the only one not trying to dance. Inamoto says don’t worry about it. No one who comes can really dance either. But if you can learn a bit, you can be moteru – a charmer – and you’d have it in common with people all over the world, from here to Blackpool! You could be a gentleman! He says, I like the romance, the awa – froth – of late Taisho, early Showa. I like the boke – soft focus. But he is not a thwarted sentimentalist. The true modern boy in those days, he says, was on the leading edge of style. Top mode, he says. I want to take the old “hard”, and mix it with the new “soft”, and go together to the future.